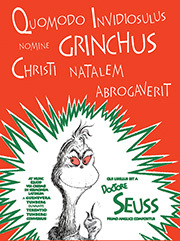 Quomodo Invidiosulus nomine GRINCHUS Christi natalem Abrogaverit (The Latin version of How the Grinch Stole Christmas) features Dr. Seuss' original artwork and a translation that echoes the love of word play and the rhythmic narrative of the world's best-selling author of children's books. Jennifer Morrish Tunberg and Terence O. Tunberg recreate the enchanting poetry of the English original. The wonderful, whimsical and thought-provoking stories of Dr. Seuss have been published in twenty languages. Quomodo Invidiosulus nomine GRINCHUS Christi natalem Abrogaverit joins the many fine international editions of the works of an American literary icon. An excellent addition to Seuss collections the world over, this Latin edition of this Christmas classic is delightful way to revisit a treasured tale. Quomodo Invidiosulus nomine GRINCHUS Christi natalem Abrogaverit will be a welcome all-occasion gift, a fine coffee table book, and an enjoyable way to refresh your high-school Latin. Yes, Virginia, there is a Santa Claus…in Latin! : Vere, Virginia, Sanctus Nicolaus est!